"Zach Johnson wins the Masters. Not a highlight exactly..."
2) Zach Johnson wins the Masters. Not a highlight exactly, more of a vindication for those who argue the changes made to the Augusta National golf course in an attempt to meet the challenges of modern golf technology have diminished Alistair MacKenzie's classic course to the extent that average players such as Johnson can now prevail at major championships. It is fascinating that only a few years ago, any criticism of Augusta National would have been highly unusual (unless it was me mouthing off). Now it's rather commonplace. Surely the club must notice this trend? "It's too early to call it a bust, but it's not too early to be concerned about its utter lack of buzz." 10. The FedEx Cup The PGA Tour has tried to force feed us the points standings. The Golf Channel keeps cramming the points list down our throats. Still, no one cares. Nothing seems to be at stake. The race to the FedEx Cup playoffs? Hardly, since 144 players qualify. Which is everybody who is anybody. And why keep track of the points since they're just going to be reset for the playoffs? There is no drama, no interest and no reason to get interested in the FedEx Cup points standings yet. It's too early to call it a bust, but it's not too early to be concerned about its utter lack of buzz. That's just so wrong. After all, if the playoffs started today, Anders Hansen would not be in them. Gary, you can't buy tension like that! 3. The Masters It was disappointing that what I've been writing for the last five years was proven correct, that Augusta National with firm and fast conditions and some wind is the toughest golf course in the world. For three days, conditions were so difficult and greens so firm that nobody could make many birdies. Never have so many good shots turned out not so good. As a result, the best players weren't able to separate themselves from the pack. Skill was equalized. It wasn't until Masters officials saw the light and softened the greens for Sunday's final that we began to see the familiar birdies and eagles and hear the familiar roars from Amen Corner. Former chairman Hootie Johnson was right to lengthen and tough the course but went a bit too far. It doesn't need rough — or whatever quaint term they call it — and it doesn't need all those extra trees planted on 7, 11 and 15. For the first time in recent memory, the Masters came close to being boring for three days. Thanks to the readers who forwarded this email making the rounds following the 2007 Masters. I think I saw the photo below in print somewhere, but can't remember where. 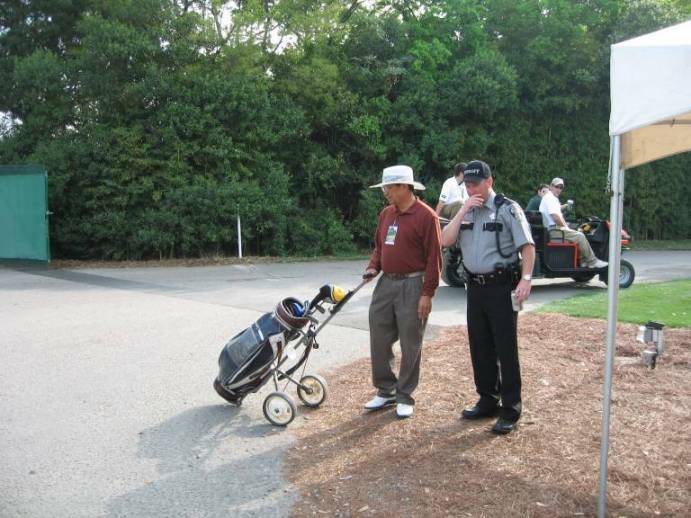 ...thought that his practice round badge allowed him to “play a practice round” at the Augusta National. The Grounds Maintenance guys in the background actually stopped and took the picture. As you can see I am struggling to restrain from laughing totally out loud. My partner, Sgt. Ken Rogers, is not in the picture because he is actually just out of the left side of the frame rolling in the pine straw, from laughter. "DVD of the 2007 Masters could, and should, be marketed as a 100% guaranteed cure for insomnia." Sunday on The Scotsman's Scotland on Sunday's John Huggan notices a trend since 1997: majors gone awry. Seven "dodgy" majors to be exact. Which he revisits in detail. Ever since the greatest golfer the world has seen annexed his first major title at Augusta in 1997 - blitzing the field by 12 strokes and wedging seemingly every approach on to what used to be distant greens - those in charge of the four most important events seem to have engaged in an unofficial contest to host the daftest Grand Slam event in history. Unofficially at least, they call it "Tiger-proofing". I call it golf's so-called administrators attempting to disguise their incompetence over the shameful non-regulation of the modern ball. You know I've suggested it many times, but Huggan gets the credit for actually coming out and saying it. And bad news for the "so-called administrators." More and more people are making the connection between extreme setups and faulty equipment regulation. And that's before I they even hear me ramble on! Most were consciously ruined in order to deflect attention away from the men who were 'asleep at the wheel', when they should have been paying closer attention to the dangerous and unlit technological road that golf was travelling. The rest were merely the playthings of those who take a one-dimensional delight in watching the best players suffer. And so, golf at the very highest level is today too often a pedestrian and penal game designed to punish even the slightest indiscretion. Forget the spectacular and interesting prospect of watching a skilled practitioner attempt a risky recovery shot. They are long gone. Veer from the increasingly straight and narrow fairways, and the only option available is more than likely the chip back into play: penalty one stroke. Separation of Church and Links? Several writers have written about or noted Zach Johnson's faith in trying to find something interesting to say about the Masters Champion. Craig Dolch did it here and of course Dan Jenkins of all people celebrated it in his Golf Digest letter from Augusta. Well Tom Witosky in the Des Moines Register files a thoughtful piece that starts out sounding like an extended version of the Zach-loves-Jesus theme, but then takes an intriguing turn by pointing out that there is only so much preaching some can take before it could backfire. Johnson's mention of his Christian faith after winning the Masters on Easter Sunday has stirred discomfort among some believing the separation between church and sport should be as strong as between church and state. "Religion and sport today has become a mutual exploitation society," said Ray Higgs, professor emeritus of English at East Tennessee State University. At the same time, Johnson's profession sparked the imagination of those who believe sport and religion can be a positive, powerful combination. And those who know Johnson, 31, say his faith is as much a part of him as is the ability to hit a five-iron within 10 feet of the cup. "There is no pretense, no hidden agenda, no proselytizing" with Johnson, said Kay Bloom, his former theology teacher at Cedar Rapids Regis High School. "Ultimately, he is owning his faith and he simply shared it with everyone." "It is really a fine line and you have to be careful from a marketing point of view," said Rick Horrow, a nationally known expert on sports marketing and professional athletics. "Zach Johnson genuinely has to be himself, and that includes his strong faith," Horrow said. "But he has to watch out that people don't think he is preaching to them." Chapman Clark, a professor at the Fuller Theological Seminary in California, said Johnson and those surrounding him will have to adjust to that reality quickly. "My suggestion is that he get himself some sharp people to help him develop his message so that it doesn't come across as exploitative," Clark said. Paging the LPGA's brand coach! Higgs, the East Tennessee State professor emeritus, has written several books and articles on religion and sport, including "God in the Stadium: Sports and Religion in America." He believes the potential tension involved in tying religion to sport has grown as American culture fixated on sports success - as opposed to sports excellence. The emphasis on winning, he said, has turned people away from the value of athletics to focus on victory and money. "The truth of the matter is there is no correlation between victory and virtue," Higgs said. "When I see those guys working hard to make pars and bogeys, well, that's us"
Last week I asked if "relatable golf" would be the future direction the pro game takes to quench our society's unquenchable for all things narcissistic. Well, Garry Smits found some fans who would agree that it's all about them while exploring the question of whether the year's other three majors (oh and The Players THE PLAYERS The PLAYERS) will be plodding bogeyfests. When it comes to majors and The Players, fans seem to want to watch the best grind. "We really enjoyed watching the Masters this year," said Kevin Leonard, a Cincinnati resident visiting the First Coast with his family to play golf at the TPC Sawgrass. "I don't like watching 27 under win a tournament." His son, James, a college student, showed that feeling crosses generations. "I know the Masters has been won on birdies and eagles on the back nine in the past," he said. "But I didn't miss that. It was fun knowing that they had to make pars to win." Dennis James, a Green Cove Springs resident, said watching PGA Tour players fight enables the average golfer to relate. "When I see those guys working hard to make pars and bogeys, well, that's us," he said. "Besides, majors are supposed to be hard." Consider also that television ratings for the Masters were slightly higher than last year, when Mickelson won at 7 under. Garry, let's not encourage the Ridley's and Driver's of the world. They're dangerous enough as it is! Former PGA of America president M.G. Orender, a Jacksonville Beach resident, said competition committees can only go so far. Weather was the main reason for the high scores at Augusta, he said, not back-room suits bent on punishing players. "I thought Augusta did the same thing the PGA does for our championship. It's a major. It should be tough, but you want the course to be fair, given the things you can control," Orender said. "Par is just a number. At the end of the day, if the course is fair, it doesn't matter what score wins." Hmmm...and here I thought it was about identifying the best player! "Augusta National, with an assist from nature, finally reined in technology." Someone highjacked Dan Jenkins' laptop, broke out the pom-poms and declared love on Dan's behalf for a no-name winning a U.S. Open at his beloved Augusta National. More than anything, some of us loved the fact that Zach Johnson never went for a single par 5 at Augusta in two. No eagle putts for this Iowa boy. But he birdied 11 out of the 16 during the four rounds. That's some kind of wedge play, son, and a winner's putting stroke. Wow, never thought I'd read Dan-the-man lauding conservative play at Augusta. It was almost as if certain writers were blaming new chairman Billy Payne and The Weather Channel for the fact that there was no Jack Nicklaus, Arnold Palmer or Gary Player on the leader board shooting 17 under par. Oh, like we don't love Dan for being the biggest of the big-name lovers. Come on Dan! I, for one, loved it. The Augusta National, with an assist from nature, finally reined in technology. That alone was worth a roar, wasn't it? This at least gives us some insight into that bizarre thought process that goes something like this: the course, patrons and players must suffer because a bunch of guys running the USGA (and not coincidentally also belonging to Augusta National) are afraid to admit they made a mistake about regulating distance. They are afraid to do what's best for the game because they would have to admit they blew it. They took the winning 72-hole score back to 289, the highest it had been since 1954 and 1956, when the basic culprits were strong, gusty winds and the hard old Bermuda/rye greens that wouldn't hold a pitchfork if Tiger Woods was swinging it. If there was anything I liked better than seeing the tour pros have to face a tough course for a change, it was learning that Zach Johnson, the new Masters champion, is an unapologetic God-fearing lad who has a Yorkshire terrier like I do. God-fearing? I heard a whole lot of thanking Jesus, not many nods to God. Or are they now one-and-the-same? "The mandated conformity of play on certain holes defies everything that Jones and MacKenzie strived to achieve"
The Augusta Chronicle's Scott Michaux says the trees and rough need to go and recommends that Billy Payne look to a group of former champions to undo Tom Fazio's changes. It's the trees and the rough, however, that seem to fly in the face of the original design and strategic intent that the club, players and patrons so passionately embrace. The constriction of options and the mandated conformity of play on certain holes defies everything that Jones and MacKenzie strived to achieve with Augusta National. The Big Three doesn't include perhaps the finest traditionalist architect today - and he happens to have a pair of green jackets as well in his locker. Ben Crenshaw understands the architectural genius that made Augusta National so great, but he's too gracious to publicly criticize the course. These gentlemen and Payne might be able to restore whatever it is that makes Augusta National and the Masters so exceptional. The club has fixed flawed changes before - from the tributary of Rae's Creek in front of the 13th green to the mounding that abuts and defends the eighth green. Not every change proves to be in the best interests of the course. We can only speculate as to how Bobby Jones might have reacted to combat the equipment issues that have forced some of the world's greatest courses to change with time. But's it's unlikely he would have seen the need for a tree - or a whole grove of them - to interfere with the playability and drama of his tournament. Well, you probably won’t hear about Augusta National making additional land purchases anytime soon so as to elongate some of its 18 holes. They needn’t bring in more trees, either, and the membership likely will postpone discussion about instituting a uniform Masters ball. Last week’s tournament tended to allay concerns about rampant golf technology, not to mention global warming, just as thoroughly as Zach Johnson chloroformed parties throughout distant parts of the world. So, my friend, you are right once again. Distance, in the majors when it really matters, is not ruining the game. Distance, in the setting by which all other settings are judged, is over. Uh, hate to be the bearer of bad news, but most the post-Masters discussion is not about what a wonderful thing it was to see the highest ever world ranked player win, but what a mess has been made of the course. And why is the course a mess? Oh that's right, because a bunch of old guys who are supposed to be really smart--many Augusta National members included--got outsmarted on the distance issue and have been cowering ever since. No, I'm kind of thinking more people than ever see that these frustrated guys are using tacky setup ploys so they don't have to address the real issue. I've been out and about at some golf facilities the last few days and heard near unanimous frustration at how boring the Masters has become. We've considered the architectural and setup influences, but after reading Stu Schneider's TV Rewind column in this week's Golf World (column not posted), it seems that we should not discount just how much CBS's presentation has played into the change in perception. The Frank Chirkinian presentation style that many of us enjoyed showed more shots and imany more of them live than we see with Lance Barrow's production approach. Schneider points out how long it took for CBS to show several shots, including Ogilvy's eagle on 13 and most amazingly, a Zach Johnson eagle birdie on 3 followed by a Vaughn Taylor missing an eagle putt on 2, even though they were paired together. Is this playing a role in uh, "rebranding" the Masters as more of a U.S. Open style event? I know I promised I'd asked my last Masters question, but the debate is just too good to let go of in light of all the great comments that this years Masters is generating. In the Rosaforte and Davis pieces critiquing the setup and architecture, there were a couple of interesting comments about the Saturday night green watering. Is it the sign of a good setup when you have to water greens during tournament play (with light winds)? Is it a sound setup when you play three days firm and then soak them for one day? Some players felt the water should have been turned on earlier, but Ridley and the Competition Committee did eventually turn on the hoses. "Yesterday we saw the weather and relocated some of the pins to make it fairer," said David Graham sitting at lunch. The two-time major winner has served on the Cup and Tee Marking Committee for 17 years and stated the goal was to make it as difficult as possible without crossing the line, "but this week was more difficult than a British Open." In the past, the competition committee has aimed to get the greens here to dry out as the week goes on. On Sunday morning, the greens were wet and receptive even though it didn't rain here on Saturday night. That's what you call a concession, but by then it was too late. Even though Sunday was a relatively wind-free, balmy day, the average score was 74.33, and the lowest score was a 69 (and only three players shot that). It seems that the ideal setup is one where the greens do not have to be artificially controlled by such a dramatic shift in watering. One could argue that a SubAir draining of moisture is just as contrived, but I would argue that that is done in an attempt to firm up conditions in order to accentuate skill. The watering this year was, as Davis wrote, a "concession." A move made after Daddy had whipped the boys around, and decided to let the flatbellies have their Sunday fun. I don't get the sense this concession was one made with great pleasure. So is this what the Masters will be in the future: three days of torture and one day of watering to shut up the critics who dare to dream that we might see another '86-Masters type finish? I can only recall such dramatic green watering happening to mitigate impending setup fiascos. And not coincidentally, Fred Ridley was the head man during the two most recent examples: 2004 at Shinnecock and the 2007 Masters. SI's Michael Bamberger writes about Palmetto Golf Club, one of golf's best kept secrets and talks to Rees Jones, whose changes to the place had to be fixed by Tom Doak. Rees Jones, who gets to Palmetto once a year, during Masters week, first played the course at the invitation of an old friend, Bobby Goodyear, one of the few Palmetto golfers who is also a member at Augusta National. Jones suggested some changes to the course, mostly in the area of bunker restoration, and oversaw the project. "I did the work for free because I love the place, and they have no money," Jones says. One of the things he likes best about Palmetto is that the members have no airs. One year during Masters week old Tom Moore squeezed in the Jones foursome in front of a group of members. "Who the hell are you guys?" one of the aggrieved golfers asked Jones. "Well, that's Michael Bonallack, who runs the R&A," Jones said. "That's David Fay, who runs the USGA. That's David Eger, who runs the USGA competitions." "Yeah — and who the hell are you?" The piece does not mention that the greens will be reconstructed and restored to their original dimensions under Gil Hanse's supervision starting in a few weeks. Okay, well not really. But they do engage in an interesting chat about this year's Masters over at golfalot.com. ...and the criticism of Augusta National's setup far exceeds the number of defenders, which in itself is monumental since ust few years ago it was rare for a writer to dare question the direction of the course changes. For starters, it's clear that all of the bickering I've done with Doug Ferguson over the changes will have to continue, because after hearing for years from our great AP writer that we must reserve judgement until a firm and fast week to evaluate the horrid tree planting, shabby looking rough and lack of tee flexibility, apparently we now need to provide a multi-year window before returning a verdict. It would be easy to suggest that Augusta National ruined its major by adding nearly a quarter-mile of length since 2001, but that would be measuring the Masters based only on this year. Ugh. I look forward to our next debate Doug! Of course, at least there's hope with the always thoughtful and passionate Ferguson, but I'm not so sure about South Florida Chamber of Commerce groupee and Golf Digest scribe Tim Rosaforte, who always gets into trouble when he writes about course setup and architecture matters. His cheerleading sounds especially lame this week in light of the overwhelmingly negative responses elsewhere. Surprisingly, there wasn't much whining. Some players felt the water should have been turned on earlier, but Ridley and the Competition Committee did eventually turn on the hoses. "Yesterday we saw the weather and relocated some of the pins to make it fairer," said David Graham sitting at lunch. The two-time major winner has served on the Cup and Tee Marking Committee for 17 years and stated the goal was to make it as difficult as possible without crossing the line, "but this week was more difficult than a British Open." Ah, taking it right up to the line without crossing it. Sunday, it warmed slightly and so did the mood. The big hitters were reaching the par-5s again, the Cup and Tee Marking Committee gave the field more accessible locations and there were birdie and even eagle roars echoing through the pines. Right. And oddly, both pointed out that no one complained, but I'm afraid they weren't talking to the right folks. Remember that declaration of Sunday joviality when reading the next few pieces, starting with Rosaforte's colleague at Golf World, Bill Fields whose excellent online "letter" was excerpted in this week's Golf World. Interestingly, the magazine picked his criticism of the course changes for publication. But following the second round, Crenshaw was asked when the course, usually so alive with cheers during the tournament, had been so quiet. While Crenshaw was talking to reporters he was interrupted by Chris DiMarco, who was making his way from the ninth green to the 10th tee. “How is it out there?” DiMarco said. Meanwhile SI's Seth Davis also blasted the lack of excitement that seemed to be a direct result of the changes, and not the weather as some have suggested. Don't try to blame all this on the wind and the cold. They've been playing this tournament on this course every year since 1934. You think this is the first time they've had a little inclement weather? Johnson's score of one over par was tied for the highest ever by a winner, and it was the highest since 1956. That's not because of the weather. That's the course. Goosen was still in the hunt when he got to the 13th tee. He hit an iron off the tee. Guess I picked the wrong week to quit drinking coffee. Gary Player has been one of the biggest advocates of making the course tougher so today's players use the same clubs on their approach shots that they did in Player's prime. Yet even he said this was the toughest layout he had seen at Augusta in 50 years — and that was before the cold weather rolled in. So no, things weren't any easier early in the week, when the sun was out and the wind was quiet. After shooting an 83 in the first round, Larry Mize said, "I was out there practicing yesterday afternoon and there were no roars out there. No roars at all. I think they need to get the roars back, because that's part of Augusta." Not anymore, Larry. This is the new Masters. The tournament ends on the front nine on Thursday. When a course is so tough it exceeds the actual skills of the players involved, then you are not "identifying the best player" as the USGA likes to quip. You are identifying the luckiest player! Its disappointing to see the Masters set up this way. "Don't worry about this week, this is not real golf." DAVIS LOVE III: Well, I think it's taken four or five years for everybody other than players to realize how difficult that golf course is now and what a challenge it is. They've taken the scoring and the fun out of the golf course and made it -- they hate the comparison, they've made it like a U.S. Open rather than a Masters. It's a grinding week. It's a real hilly golf course. It's a tough tournament, plus they've made the golf course extremely hard. So it's a long week. It's been that way for the last five or six really, at least. Q. Could you talk a little bit about how a lot of people have talked about how Augusta was limited to the big hitters winning the last couple years, but this year it played so firm and fast, some of you guys' balls may have actually been running into trouble and actually could have hurt some of the big hitters a little bit, how it played this year? DAVIS LOVE III: Well, I don't think it's really ever -- that's always been a big talk. You have to be able to hook it and you have to be able to hit it a long way. Ben Crenshaw has done well there, and the list of guys I just gave, plus Mike Weir. Not necessarily do you have to be a bomber any time. You have to chip and putt well and you have to hit really precise irons to be able to play. Yeah, they've made it long, but we're used to that. Everybody has got length now. It's just a big overreaction to they've perceived that the game has gotten too easy. They want scores to be high. I think a short game has always been good at Augusta, and Zach proved that, and like I said, Olazábal, Langer, grind it out, chip and putt. It's gotten to be Retief Goosen kind of golf, make a lot of pars and you can win. I certainly wished that I could do that because that's what it takes to win more out here now. The Greg Norman or Jack Nicklaus style of -- a lot of big, flashy shots and a lot of birdies will win, but that style of golf is tougher to do now. It's got to be more methodical and you've got to chip and putt way better. If I'm teaching my son to play golf, sure, I want him to be long, but you've got to have all the short game shots because they're not going to give you a golf course where you can hit 16 greens a round like they used to. You've got to chip and putt. If I was a fan, I would be -- I think as a Tour, we can't control the majors, but as a Tour we have to be real careful with our Players Championship and our course setups, that we don't fall into that trap, because most people don't want to watch pros putt for pars on TV. I think we've got to be real careful about that and make sure there's some risk-reward. There's no risk-reward on laying up on 15 every day or laying up on 2 every day or 8. It's just wedging in. Long putts for birdies or short putts for par, I think we have to be real careful about that. Q. Does that change coming here a little bit? Is it a little bit less demanding? DAVIS LOVE III: This tournament is more about the weather, really. When it's windy and cold and dry, it plays tough, and when it's wet and calm, you see 13, 14, 15, every once in a while 18-under will win. But if it's really windy and it's really cool, then the scores go way down. We've seen 6-, 7-under win. But that's because it's a good, solid golf course, and it's dictated on the weather. Here and Colonial seem to get the best reviews from the players because it's all golf course, it's not tricked up. It's a good, solid design, and you can still play. If the weather is bad, the scores go up. That's the thing, at a major now, if the weather is bad they go ridiculous, rather than just from 13-under to 7-under, it goes to average scores of 77s and 78s. And you know if the pros are averaging 77 or 78, the course is probably not fair. It's probably over the edge. I said to Rich Lerner this morning, what would I shoot at your home course? We go out and shoot 66 every time. On Tour maybe the average should be 68 or 69 or 70, not 77. That just shows you how hard it is. I mean, even we are astounded at how hard the U.S. Open and The Masters is, so the average person just can't comprehend how hard a golf course it is. I told John Kelly when we got down to 18 on Friday, I said, "Don't worry about this week, this is not real golf. Don't beat yourself up." Because it's not, it's some other game, and it's more a mental test than it is a physical test. That's why, again, you see guys like Langer and Mize and Mike Weir, guys like that, do well, Retief Goosen, because they're really, really good. But you put them on The International, that format on that golf course, they're not going to do very good with that style of game. It's nice to have a variety. It seems like the variety has gone out of -- especially out of our three majors over here. A classic SI cover this week, with Robert Beck's shot of Tiger wrapping his 4-iron around an Augusta National Christmas tree. Golf World's J.D. Cuban also captured a fantastic sequence of the same moment, but from the side (viewable here along with other Round 4 images). I'm going with "I know it was you Fredo. You broke my heart. You broke my heart!" Wait, Smith is Fredo. That doesn't work. Ah, you all can do better. Just consider this with regard to the earlier post on Tiger Woods and the 15th hole as the turning point. If Tiger has a clear shot at the 15th green Sunday instead of having to hit some silly cut around a Christmas tree, is there not great potential for the kind of explosive golf that so clearly defined the Masters in the previous century? In other words, with a shot at the green and the potential roar of an eagle putt (and birdie at worst), does that reverberate through the property and influence Zach Johnson's play on 17 or 18? On the news that ratings were actually up for this hardly satisfying 2007 Masters, I've heard from a number of people that they argued with friends over the weekend about the setup and the joys of watching great players suffer. There is a sizeable audience of the viewing public that enjoys watching the best players struggle. They like seeing them humiliated and brought down to a lower level of skill. "They know how I feel now." This mentality has been around a long time and many of the games lesser-informed writers have celebrated the notion of pro golfers serving as modern day gladiators served up for the people to devour in humiliating spectacles. So I'm wondering if championship golf is going to go the way of everything else in our society. Will it have to become "relatable" (as the marketing folks like to say) for big-time golf to succeed? In other words, will professional golfers eventually serve at the pleasure of the people, with major events played to publicly humiliate millionaire golfers on overcooked layouts in order to make the average man feel better about his lousy game? Personally, I find it to be an incredibly selfish way to view golf. It's a lot more fun to see the talent of these great players exposed, celebrated and savored. But maybe that's old school? Thoughts? Bill Fields at GolfDigest.com with a Darwinesque letter from the 71st Masters.